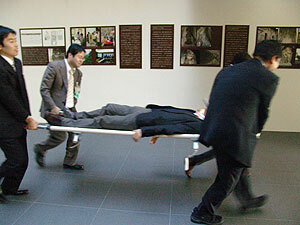 An integrated firefighting drill was conducted at the Institute starting at 10:30 a.m. on January 26. The simulated fire started in the hot-water service room on the third floor of the Institute. Training included the early extinguishing, reporting the fire, evacuation guidance, and first-aid, centering on the in-house firefighting team comprised of Institute members. 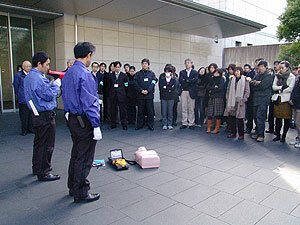 In addition, many staff members who were at the Institute on that day participated in the drill. At 10:30 a.m., the fire alarms went off, and the message “A fire has broken out. Evacuate!” was broadcast. The in-house firefighting team and the person who detected the fire used fire extinguishers to simulate fast extinguishing, and simulated a call to 119. The staff was guided, and evacuated the premises. At the same time, we set up a firefighting head office and a first-aid station, and the in-house firefighting team evacuated one trapped member who became sick inhaling smoke on a stretcher, and carried out important cultural properties (simulation). After the drill, Director Suzuki expressed his thanks for the response to the training and talked about this time, a turning point of the 55th Fire Prevention Day for Cultural Properties: We must always take care because we can never know when or where a fire will break out. Mr. Suzuki discussed the unknown cause of the destruction by fire of the Mural Painting of Horyuji Golden Hall, which was the event that inspired the Law for the Protection of Cultural Properties. His comments boosted fire prevention awareness among all participants. After a lecture on types of and the proper way to use fire extinguishers, training using practice extinguishers were carried out with a voice of “Fire!”. Also in this training, a demonstration was held on how to use the automated external defibrillators (AEDs) installed in the Institute: Participants listened carefully to this demonstration, showing high interest in the importance of life-saving measures. 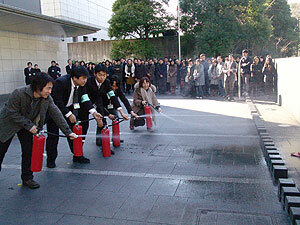 The Institute has a yearly fire drill as an event associated with “Fire Prevention Day for Cultural Properties” on January 26. 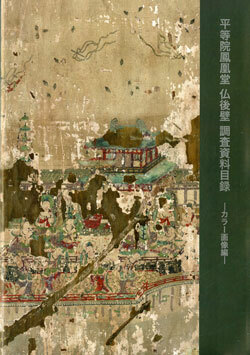 The Institute examined the wall-behind-Buddha in the Phoenix Hall in 2004 and 2005, in cooperation with Byodo-in Temple in Uji-city, Kyoto. This examination was carried out along with the repair of the national treasure seated Amitabha Tathagata and canopy in Phoenix Hall, which was carried out for five years starting in 2003. In this project, entitled “Heisei Large Repair”, the halo and pedestal, as well as the Buddha, were brought out from the Hall, and the wall behind the Buddha, which usually cannot be seen in detail, became visible. The examination included the color, fluorescence, and near infrared photography of this wall, as well as a pigmentation survey. This was the first time that the entire wall behind the Buddha was photographed since its founding. 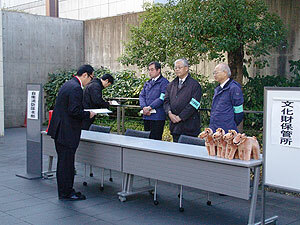 On January 23, a news conference was held at Byodo-in Temple and it was reported on newspapers and NHK news. The material list that will be issued includes a near infrared image edition in 2009, and a fluoroscopic image/ fluorescent X-ray analysis data edition in 2010. There are various opinions on the subject and date of the painting of the wall behind the Buddha, so we hope that a series of reports will provide useful information on the future study of art history. 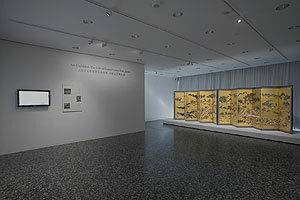 In commemoration of the repair of “the Hie Sanno Sairei-Zu folding screen” completed under the Cooperative Program for the Conservation of Japanese Art Objects Overseas in 2007, the Houston Museum of Fine Arts, which owns the screen, is holding an exhibit of the repaired screen entitled “Art Unfolded: Japan’s Gift of Conservation” from January 17 to February 22. Before starting repair, the Museum wanted to exhibit the materials/tools and processes that were used for the actual repair, along with the repaired work, so that Japanese culture and traditional techniques could be comprehensively understood. Our Institute cooperated with preparation activities. In the exhibit room, the Chinese papers, paints for repair, brushes, round knives, and other tools have been placed in an exhibit case with a touch panel sensor: This makes an interactive display that enables viewers to touch the case and view a video explaining the stored items and repair processes. This display was very well received because it gave a deeper understanding of the conservation and restoration of Japanese cultural properties which were little known overseas. At the same time, the Museum played a video showing the actual Hie Sanno festival in cooperation with the Otsu City Museum of History, along with “Weaving Gold Brocade: Mounted Strips Decorating Calligraphic Works and Paintings” in cooperation with the Kyushu National Museum. It deeply introduced Japanese traditional culture. 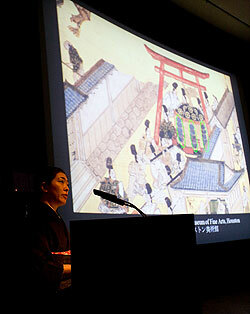 On January 19, a symposium was held commemorating the exhibit (aid: Japan-United States Arts Program, Japan Foundation). Following greetings by Mr. Ohsawa Tsutomu, the Japanese Consul General in Houston, Mr. Takahiro Nakamura, Conservator for the Association for the Conservation of National Treasures, Kyushu Section, gave a lecture entitled “Treasured Japanese Tradition: Conservation of the Hie Sanno Sairei-Zu Screens”; Mr. Nakamura was in charge of the actual repair. Tomoko Emura presented a lecture on the characteristics of the work from the viewpoint of art history, entitled “A Divine Procession: The Hie Sanno Sairei-Zu”. More than 150 people gathered in the Hall of the Museum, and symposium was a valuable opportunity in terms of both reports on the results of the research and engaging in international cultural exchange. This international seminar was hosted by organizations such as the International Social Science Council and National Autonomous University of Mexico and was fully supported by the Mexican government and Oaxaca City. Miyata Shigeyuki, the Department of Intangible Cultural Heritage, was invited as the sole participant from Asia, and gave entitled The Creation of Future Intangible Cultural Heritage in Japan. Mexico is a committee country of the Intergovernmental Committee for the Convention for the Safeguarding of the Intangible Cultural Heritage, a constituent country of the supplementary organization that examines the candidates registered in the representative list currently submitted by each country, and one of the countries that positively develops activities for conserving intangible cultural heritage. This seminar invited certain key people who conserve intangible cultural heritage, including the Director-General of UNESCO and Mr. Cazdanard, the chairman of assembly conference for signatory countries of the Convention for the Safeguarding of the Intangible Cultural Heritage. Vivid discussions were held with relevant local individuals. The Department of Intangible Cultural Heritage hopes to positively participate in such opportunities and widely communicate the Japanese experience. New 3D measurement system developed by Toppan Co. Ltd. 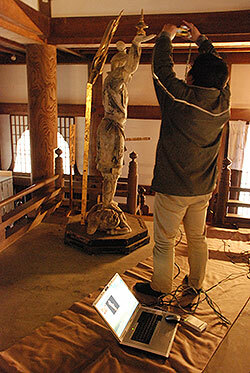 The Center for Conservation Science and Restoration Techniques is studying anti-seismic measures for clay statues as part of its research project on disaster prevention plans for cultural properties. 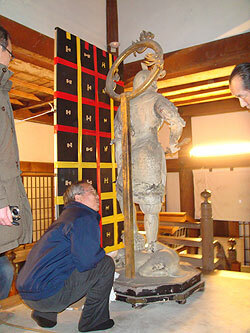 This winter, some investigations were conducted for the purpose of planning anti-seismic measures for Sozo Shitenno Ryuzo (standing clay statues of the four guardian kings), a national treasure enshrined in Kaidando of Todaiji temple. These clay statues were previously examined by the Nara National Museum in 2002 when they were exhibited in a special exhibition. In the present investigation, a 3D measurement system developed by Toppan Printing Co. Ltd. was used and X-ray radiography was conducted. Since to use the 3D measurement system it was not necessary to move the statues that are exhibited in a crowded location, it was possible to obtain information on parts that were considered difficult to measure until now. We will continue to make use of these measurement results to execute anti-seismic analysis for clay statues. In the process of safeguarding the Bamiyan site, conducted by the National Research Institute for Cultural Properties (Tokyo and Nara) since 2003, several hundred Buddhist manuscripts were discovered in stone caves. However, since the condition of these manuscripts was very poor, immediate conservation measures were necessary. The Japan Center for International Cooperation in Conservation invited Afghan conservation experts from the Kabul Museum as was done last year and jointly executed the conservation of these birch bark Buddhist manuscripts. Mr. Mohammad Sarwar Akbar and Mr. Hakim-Zada Abdullah stayed from November 14, 2008 to January 30, 2009. The deformed pieces were spread and mounted (secured on supporting body) for future exhibition. An observation of the surface of the Buddhist manuscripts made at the Institute with the cooperation of experts in conservation science revealed that there were some pieces to which a substance, most likely pattra (palmyra leaves), and pigments had adhered to the surface. All the 589 pieces were conserved and safely returned to the Kabul Museum in Afghanistan on January 30. Joint conservation with Afghans allowed us to cooperate in capacity building and transfer of techniques for Afghans who are engaged in the rehabilitation of cultural properties. 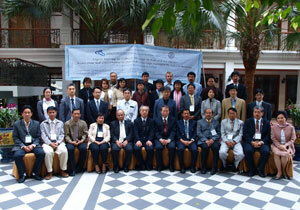 From January 14-16, 2009, the Expert Meeting on Cultural Heritage in Asia　and the Pacific: “Restoration and Conservation of Immovable Heritage Damaged by Natural Disasters” was held in Thailand. This meeting was jointly sponsored by the National Research Institute for Cultural Properties, Tokyo and Fine Arts Department of the Ministry of Culture, Thailand. It was also supported by SEAMEO-SPAFA (Regional Centre for Archaeology and Fine Arts under the aegis of the Southeast Asian Ministers of Education Organization) and the Embassy of Japan in Thailand. On the first two days, a round-table conference was held at the Siam City Hotel in Bangkok, and on the final day there was an excursion to the sites in Ayutthaya where actual measures against and post-disaster restoration are being implemented. 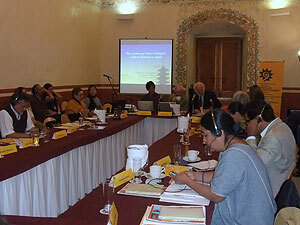 At the round-table conference, one representative each from Indonesia, Malaysia, Myanmar, Philippines, and Vietnam as well as Thailand and Japan made presentations. Observers, including local university personnel, presented their opinions and asked questions, and active discussions were held. During the excursion, various types of information on restoration materials were shared by the participants. The Japan Consortium for International Cooperation of Cultural Heritage plans this year to study international cooperative structures in developed countries as part of its information collection activities. 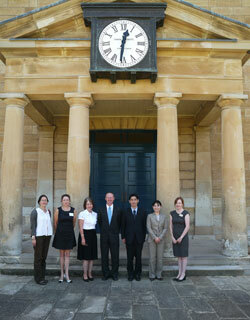 One of the study activities was a survey in Australia that we held from January 20 to 30. We interviewed a total of 14 organizations and individuals, including administrative organizations, research institutes, and private consultants engaged in international cooperation for cultural heritage. We also looked at the institutions Australia uses to create items of international cooperation in cultural heritage, and to develop business. As a result, we learned that Australia has some issues in common issues with Japan – coordination for economic development cooperation and supporting domestic youth – and some differences – a flexible information coordination network between related people and a distinct division of roles. We could collect useful information that will greatly help in examining Japan’s international cooperation structure in future. On January 18, the international symposium ‘Rediscovering My Cultural Heritage’ was jointly sponsored by the Agency for Cultural Affairs, Asahi Shimbun, and the Japan Consortium for International Cooperation of Cultural Heritage. This symposium was our first attempt of focusing on ordinary people, and was planned with the goal of helping people feel familiar with cultural heritage and learn about the existence of international cooperative activities to conserve familiar cultural heritage. We invited author Mr. Asada Jiro and Ms. Brigitte Scholz, a representative of IBA Corporation Project who works on the use of the German industrial heritage, to introduce a new type of heritage. 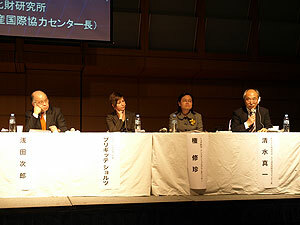 In addition, reports were given by Mr. Kwon Sujin of the Toyota Foundation, and Mr.
Shimizu Shin’ichi, the director of the Japan Center for International Cooperation in Conservation of National Research Institute for Cultural Properties, Tokyo; these individuals spoke about examples of international cooperation for cultural heritage. 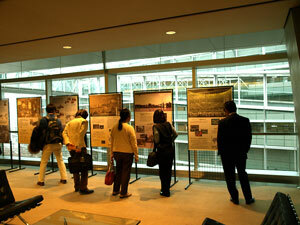 We also exhibited panels that introduced international cooperation activities for cultural heritage in Japan, and distributed pamphlets. Nearly 400 people participated, and the message could be transmitted to many people.